A link to "Download Norton Internet Security Online" will be sent via email. Your link to 'Download Norton Internet Security Online' has been sent! As a Comcast Business Internet customer, you can purchase Norton™ security software in the Cloud Solutions marketplace. Help protect your network against intruders and be assured that your sensitive business information is protected with additional layers of security. From the MyApps page, select the Norton tile and accept the Terms and Conditions to launch the Download page. 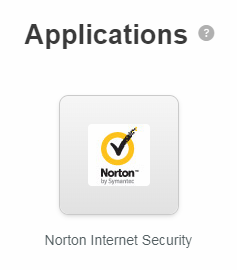 Note: If you do not see the Norton tile on the My Apps page, go back to the Cloud Solutions homepage and search for Norton. Then follow instructions to purchase an application. You can assign additional users to the application in the Account section to provide them with instant access to the app.